When I first came the school had a very bad reputation. I was told some teachers even cried when they are sent to the school. 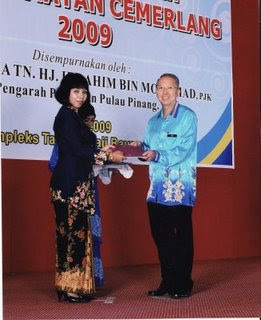 I was offered a place here and I eagerly accepted because that meant I would not have to drive to Balik Pulau everyday. At first I was always given the last classes to teach. 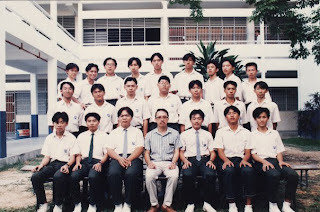 The Form 5 boys were quite ok. 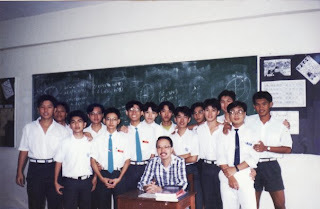 It was the Form 3 last class which was really terrible. Sometimes you get so angry you just feel like slapping them. Those days the school adminstration asked you to handle the discipline yourself, otherwise you just ask for a transfer. I didn't even think about that but some teachers did leave for other schools. In some classes, the boys would just get up and leave in the midst of your teaching. There was a certain class which I had to bolt one of the doors from the outside so that they won't sneak off from the back door! You wouldn't believe how I manage to maintain discipline in class. 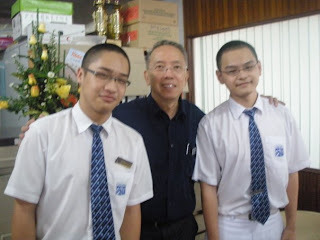 If I say I used to slap them, nobody can imagine Casey the gentle well-mannered, patient teacher can do such a thing. The students usually try to test you. And they were shocked at my reaction. When one of the senior teachers saw me catching hold of a student by the collar and pushing him against the wall, she was shocked..so were the other students. Once I went inside a lab to go to the prep room to do something and a student jeered at me in Hokkien. I went over, looked at him and before he knew what happened gave him a tight slap and walked away. The teacher teaching was shocked and the whole class fell silent. Of course that was 18 years ago. Teachers don't do this sort of things nowadays. If you touch them now, you'll be in trouble. But the best thing is the students who were slapped do not grudge you. Once I met a couple at Macdonald's and the boy called me "Sir! Do you remember me?" I said" Of course I remember you" And he told his girl friend I remember him because I slapped him. And we both laughed. Actually they may be naughty but can be fun to be with, too. 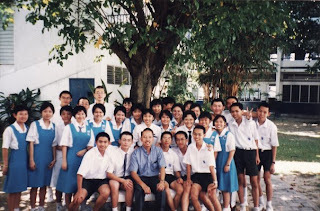 Whatever type of students, they can still be Casey's friends. 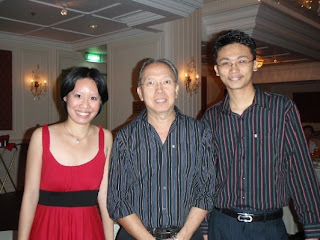 I remember Mr G mentioned to me when he first came to the school. "You are not fierce what, how come the students run into the class when they see you coming". So I said maybe they respect me. Actually its true, I don't always raise my hand....in fact I only did that a few times. But they sort of respect me and know I mean business and I can also get very angry sometimes. Anyway after Mr G came, the school underwent changes slowly but surely. As the academic performance improved, Mr G pulled me up to front classes. I was asked to teach both Chemistry and Add Maths. 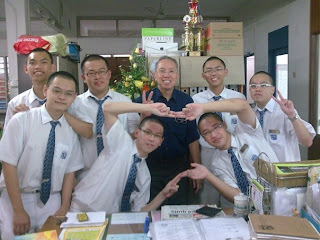 This is the group which I taught Chemistry from form 4 to Upper 6. 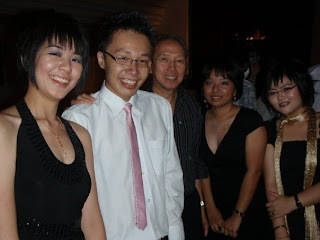 4 of them are now doctors.And when Form 6 started, I moved up to teach Form 6 Chemistry only. 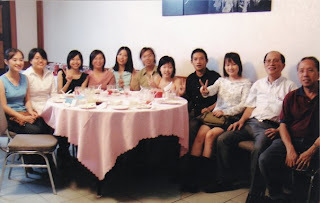 The boy (4th from right) in the picture above will graduate as doctor this year. 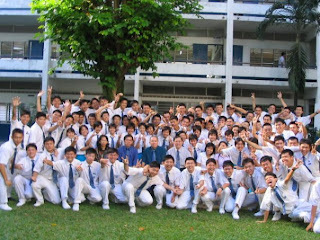 This batch is the 2006 batch. Two of them are doing education degrees.some of them are my facebook friends also. 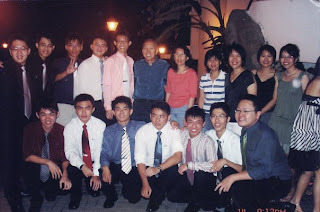 The 2007 batch, one of the largest group...dragon babies all of them These photos are taken at the 2008 form 6 dinner.. And these are the 2009 batch of students...facebook family photo! 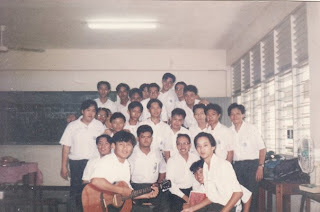 no photo for batch 2008? ?